1. Cut the liver in bite size pieces and wash thoroughly. 2. Place on a drainer and keep aside. 3. Heat the pan on medium with oil and add the sliced onion, bay leaf, cinnamon stick and cardamom. 4. Fry the onion till it becomes transparent and add ginger, garlic, chilli, turmeric, coriander, onion paste and salt. 5. Cook it till oil is separated and add coconut cream. 6. Cook 3-4 minutes and add the liver pieces. 7. Stir it and cook it under closed lid. 9. Check the salt and add roasted cumin and remove kolija bhuna/ spicy liver from stove. 10. 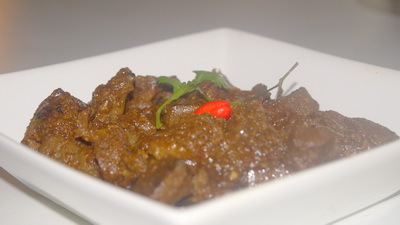 Serve kolija bhuna/ spicy liver hot with rice, paratha or roti. Hi. I want to cook Chicken liver? Can I use the same recipe? Hi! yeah you can use same recipe.Thanks. thks for the delicious recipe. don’t we have to boil the liver a bit and drain the water before cooking?